Travis Marcum has led ACG’s Education Program since 2006. He’s overseen the growth of our local programs to over 40 schools with 2,000 diverse students, and GuitarCurriculum.com to a resource serving in hundreds of locations around the world. Matt and Travis talk about growth and change in Education at ACG – our most prized program. Has ACGS or classical guitar changed your life? Email your story to us today. You can help! Donate to our Changing Lives fall fund drive today. For more on our work in education – click here. To learn about our online curriculum that is the backbone of our education programming – click here! Read the previous Changing Lives story, about Matt’s last ten years with ACG, here. 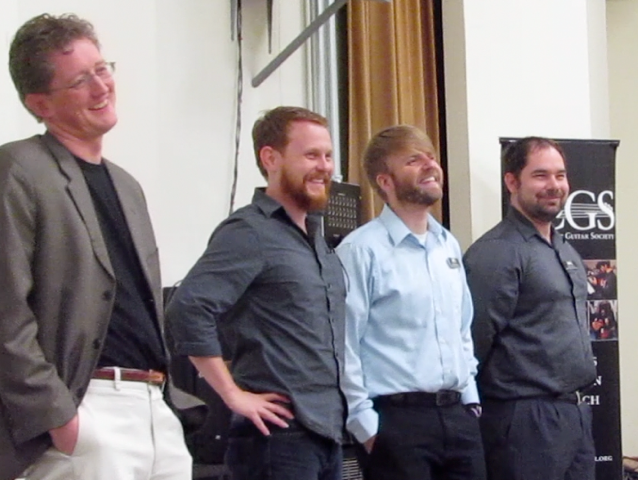 Here’s a shot of Matt with our core Austin education team at this past summer’s national teacher training (left to right): Matt Hinsley, Travis Marcum, Jeremy Osborne, and Eric Pearson.